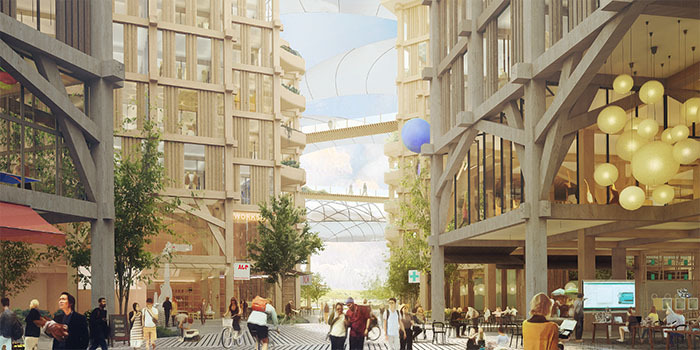 These exterior (above) and interior (below) renderings of Sidewalk Labs’ Quayside Development planned for Toronto, Canada’s waterfront are representative of the scale to which some of the world’s most forward-thinking brands are embracing mass timber. Images courtesy of Sidewalk Labs. What makes me most optimistic about what’s to come is that mass timber has moved into the mainstream. No longer is it just a unique new way to build, experimented on by a few architects, contractors and developers. Some of the world’s most popular, thought-leading brands, including adidas, Sidewalk Labs, Microsoft and Google, have jumped all-in. These companies are not just major brands. They are cultural paradigm-changers. And they all are embracing mass timber in a big way – for the most important of reasons. They recognize that climate change is the biggest challenge we face as humans, and they see the tremendous potential mass timber offers as a significant contributor to solving the climate change challenge. 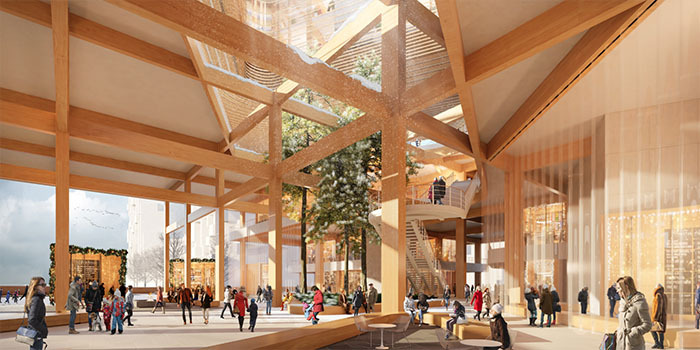 - Microsoft: Multiple mass timber structures make up the renovations to Microsoft’s 643,000-square-foot, 32-acre campus in Mountain Park, Calif. Their primary motivator for using mass timber is sustainability. - Google: They’re embracing mass timber and other sustainable technologies in order to use their purchasing power and influence to drive scalable sustainability solutions. - adidas: With its North American headquarters right here in Portland, adidas has chosen mass timber for two buildings totaling 467,000 square feet on its campus in North Portland. Corporate Real Estate Director David Remos cited sustainability and employee well-being as primary drivers behind choosing mass timber. All of these large companies are putting their money, and their social leadership, into something they truly believe can be a world-changer: mass timber. The 2020 International Mass Timber Conference will be held in Portland again next year, March 24-27. Can’t wait to see what happens then. Whether or not we like them all, every one of us comes from a family. Families have unique traditions they pass down from generation to generation. I grew up in Rhode Island in a large Irish Catholic family. We celebrate St. Patrick’s Day like it’s a national holiday, and even eat something called boiled dinner, which is the Irish-American version of corned beef and cabbage. At this point, you may be asking yourself: What has this got to do with Oregon forests? Well, Oregon forests are unique, and they also have a family component. I don’t know how big your backyard is, but in Oregon there are a lot of people with very big backyards – often filled with trees. In fact, there are about 65,000 Oregonians who own what’s known as a small woodland. These are usually 10 or more acres in size. The part where the family comes in is that, historically, most of Oregon’s small woodlands are family properties. They’ve been passed down from one generation to the next, and as families have grown, some have been divided among family members and others have been kept intact to be used as a family gathering place. Another unique aspect to these properties is that they are woodlands, which means they’re considered forestland and classified as timberland. Timberland is forestland that can productively grow commercial-grade timber. Families that own a small woodland are in it for the long haul, and generally speaking are not trained foresters. Mostly they’re Oregonians who are stewards of the land, wanting to do the right thing and follow all of Oregon’s forest-practices regulations. Day to day, these landowners are busy living their lives, raising their families, paying their bills, etc. Then, about every 50 years or so, they decide whether or not to harvest and sell the trees on their property. Usually the decision is based on a big family event, such as paying for college, a wedding or a home remodel. This is where the Oregon Forest Resources Institute (OFRI) and our Landowner Education program come into the picture. We partner with organizations like Oregon State University Extension Service and the Oregon Small Woodlands Association to deliver landowner education. This includes offering workshops to help small woodland owners understand Oregon’s forest protection laws. We use a special publication we produced for this programming, called Oregon Forest Protection Laws – An Illustrated Manual. We also provide publications designed for non-professional foresters, on specific topics such as wildlife protection and fire risk reduction. 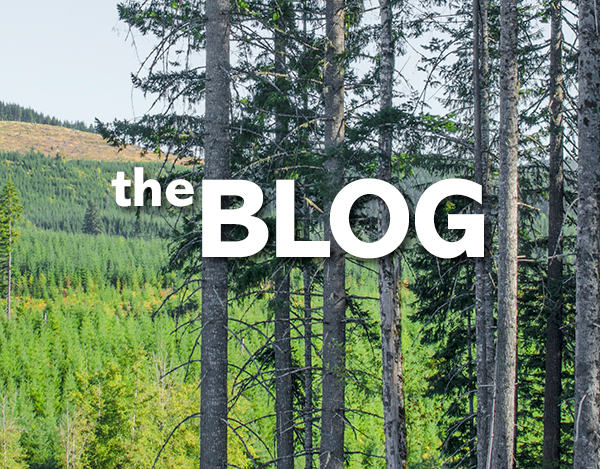 To reach small woodland owners in as many ways as possible, we maintain a website, KnowYourForest.org, that offers basic information and resources on many important topics related to managing forestland in Oregon. OFRI has two professional foresters on staff who lead all these efforts, Mike Cloughesy and Julie Woodward. Mike and Julie work closely with landowners to help them understand how to properly take care of their land, so it will be here for the next generation to benefit from and enjoy. It’s not every day a nearly 100-year-old company gets recognized as being among the world’s most innovative. Oregon-based Freres Lumber Co. did just that. The business magazine Fast Company recently named Freres Lumber as the fifth-most innovative company in the world in the Urban Development/Real Estate category for developing mass plywood panels (MPP), the first wood veneer-based mass timber product to be certified for structural use in building construction. Fast Company compiles its annual list of the World’s 50 Most Innovative Companies, along with top-10 lists in 35 industries, to draw attention to companies that are leading their fields and transforming the world. Making the list places Freres Lumber squarely alongside other more obviously innovative companies such as Apple, Ali Baba Group, 3M Corporation and Rocket Lab. Not bad for a 97-year-old, third-generation family-owned lumber and plywood producer based in the small town of Lyons. Billed as an alternative to cross-laminated timber (CLT), MPP is the first and only mass timber panel product to be made entirely out of structural composite lumber, a type of engineered wood product created by layering dried and graded wood veneers, strands or flakes with moisture-resistant adhesives into blocks of material that are subsequently sawed into specified shapes. 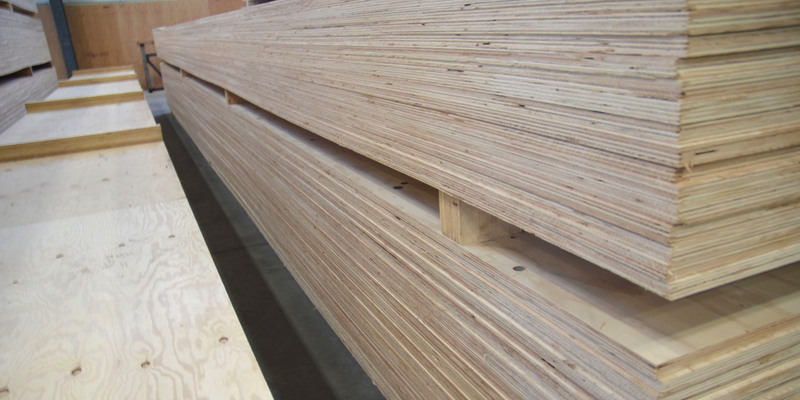 MPP can be used just like CLT, but requires 20 percent less wood fiber to manufacture, making the product lighter and more efficient than CLT and other competing products, according to Freres Lumber. In addition to its MPP product, Freres produces veneer, plywood and lumber. It also operates a cogeneration facility fueled primarily by wood residuals from the milling process, producing electricity for over 5,000 households while simultaneously generating heat for the company’s production processes. 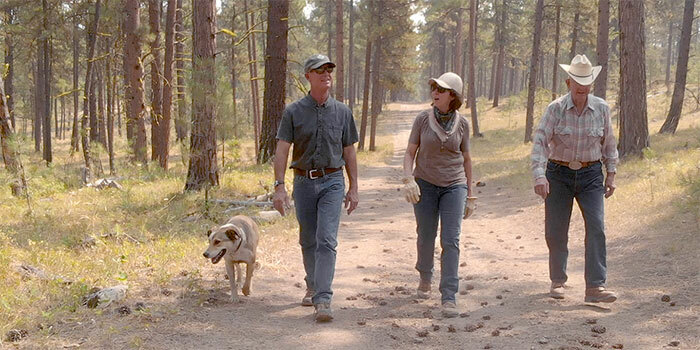 The family also owns and manages more than 17,000 acres of timberland, located primarily in the Santiam Canyon. Not the sort of company that immediately comes to mind when talk turns to innovation – but one deserving of being in that conversation. Coincidentally, just a day before I’d heard about these innovator awards, I’d read about the Calgary Library in Wood Design & Building magazine’s annual wood design awards issue, in which the project is recognized with the highest honor in the North American category. The library’s design is truly spectacular, as you can see for yourself. According to Fast Company, its World’s Most Innovative Companies lists are intended to provide both a snapshot and a road map for the future of innovation across the most dynamic sectors of the economy. It’s great to see mass timber products and wood buildings being recognized in that light. The Oregon Forest Resources Institute (OFRI) is dedicated to advancing public understanding of forests, forest management and forest products. One of the primary audiences for our educational efforts is K-12 students and teachers. That’s because what the youngest Oregonians learn about one of our state’s greatest resources is vitally important. And just as important is what their parents learn through their children’s experience, especially as the demographics of our state change and many of today’s Oregonians are new to the state. Full disclosure on my part: I am not a native Oregonian. I was born and raised in Rhode Island, and moved to Oregon in 1996. But as the mother of two native Oregonians, I have firsthand experience with what my children learned about Oregon’s forests, and what I learned from them. For both my daughters, the highlight of sixth grade was attending Outdoor School at Camp Howard. It wasn’t just the opportunity to spend time away from home with their friends. They both came back with knowledge about Oregon’s abundant natural resources and a desire to share what they had learned. A key part of my daughters’ enthusiasm came from their sixth-grade science teacher, Sarah Zinzer. That is just one of the reasons I’m proud that OFRI not only supports training for teachers, but also classroom and field programs for students, and grade-specific publications for K-12 teachers and students. You can find a complete list of resources for K-12 forest education in Oregon here. 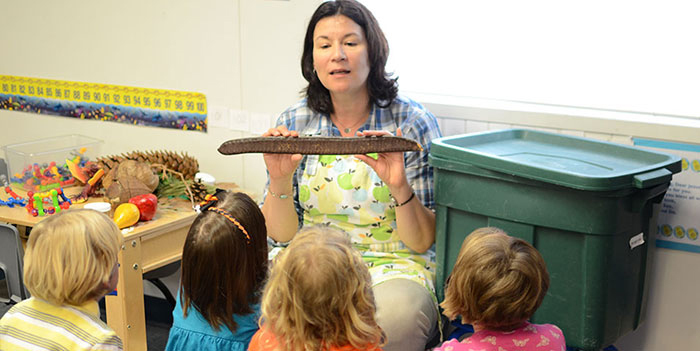 From a classroom perspective, OFRI partners with Talk About Trees, which places trained educators in classrooms around the state to deliver a hands-on program about the importance of trees and wood products. Amazingly, this program reaches nearly 150,000 pre-kindergarten through eighth-grade students each year! We also recognize the value of getting students outdoors and into the forest to learn about the importance of Oregon’s forests and natural resources. That’s why we provide bus transportation funds that make it possible for classes to participate in forestry-related field programs around the state, such as those offered by the Tillamook Forest Center, Port Blakeley Tree Farms and Forests Today and Forever. For older students who are getting ready to enter the workforce or post-secondary education, OFRI is working with the Oregon Department of Education and other partners to promote more natural resources-focused career and technical education (CTE) programs at high schools throughout Oregon. We support these programs by helping develop a comprehensive curriculum and offering teachers professional-development workshops and conferences as well as tours where high school teachers visit forests and mills to see forestry and wood products manufacturing in action. Our LearnForests.org website serves as a resource library for K-12 educators seeking materials and curricula to teach about Oregon’s forests and natural resources. Aside from all the great content and resources we provide on this website, we also offer all our printed K-12 educational materials free of charge. In fact, we print and ship the materials directly to educators and schools around the state. The hope is that by providing an array of educational resources, as well as supporting classroom and field forestry education programs, we’ll help young Oregonians understand how forest stewardship meets the social, environmental and economic needs of both present and future generations.